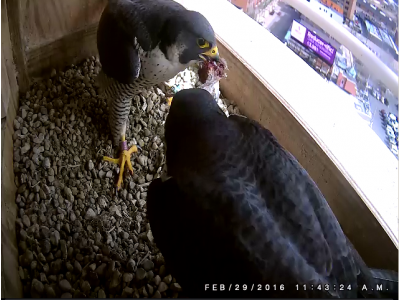 Our resident Peregrine falcons, Rebecca and Kewpee, stayed in downtown Kalamazoo all winter and have visited the nest box regularly. Although peregrines are great migrators, there is plenty of food in the downtown area and the urban birds often stay in their home territory for the winter. Kewpee especially spends time perched on the edge of the box surveying the town. Now, in early March, they visit the box frequently during the day and are both occasionally (although briefly), in the box together typically first thing in the morning. They are showing signs of courtship and Kewpee has given up his lunch to Rebecca (or at least not resisted her taking his food and absconding with it). Last year, mating occurred in mid to late March and four eggs were laid between March 27 and April 3. Both parents shared egg sitting duties during the month-long incubation and the eggs hatched between May 4 and May 7. Both parents were kept busy feeding the hungry eyasses (a fancy term for nestling falcons). Thirty-eight days after hatching, the first chick took flight on June 11, followed by fledging by the other chicks on June 13 and June 14. Two chicks were grounded on their first flights and ended up in rehabilitation (one of them twice). Despite the rocky start, all four youngsters successfully learned to fly and hunt well enough to leave by early August to start their own adventures. They will travel a lot for a couple of years and could go in any direction. We have not gotten any reports of misfortune so we hope for the best. Based on the history from previous years and the recent courtship behavior we expect mating to occur again in mid-March and will be looking for eggs at the end of March and hatching about a month later. You can easily follow the activity of the falcons from the comfort of your own computer anytime. However, if you would like to take a more active role, there will be opportunities in June to be on location in Kalamazoo and patrol as the chicks fledge, deliver flyers to downtown businesses to alert them to fledging activity, or transport downed chicks to rehab. Please use the contact us button on the website to let us know your interest and availability to help the peregrines this summer.